Morrison Ranch is a mixed-use, master-planned community offering a quality living environment where people of all ages can live, work, play, shop, and learn. 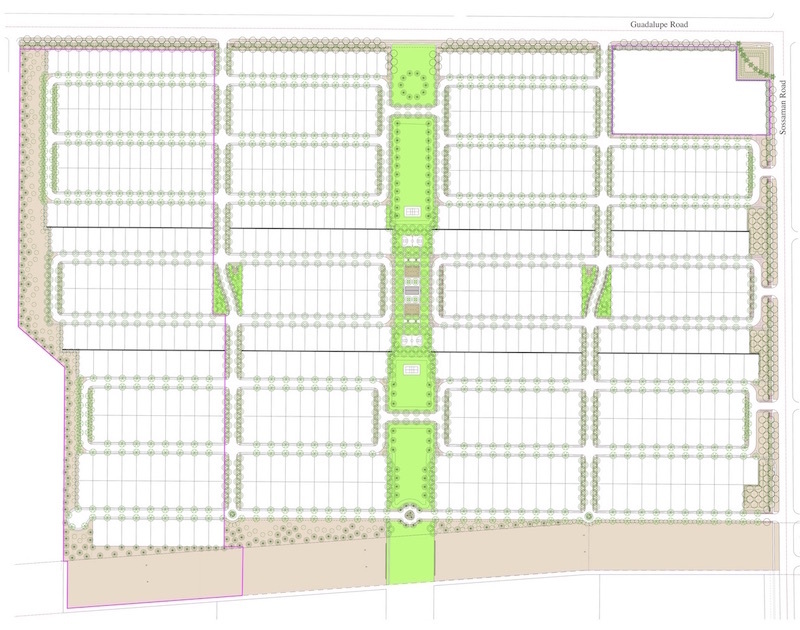 As you can see in the master plan below, Morrison Ranch features a uniquely balanced diversity of land uses. 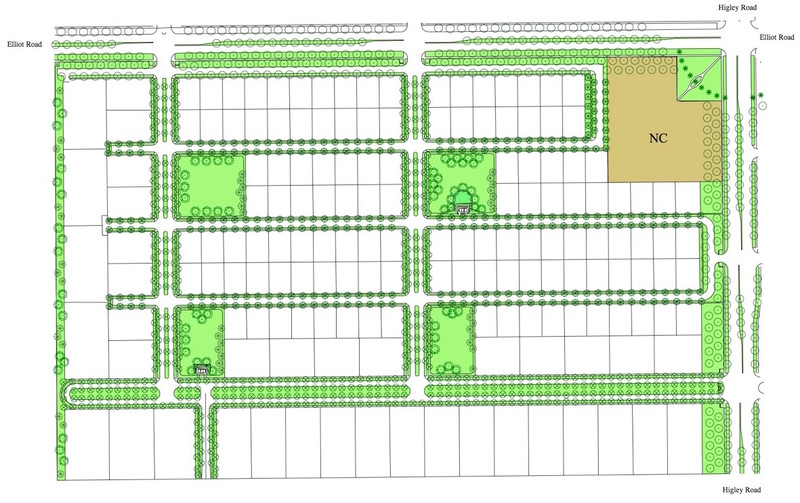 Residential areas of low, medium, and high densities, for example, can all be found within one neighborhood. 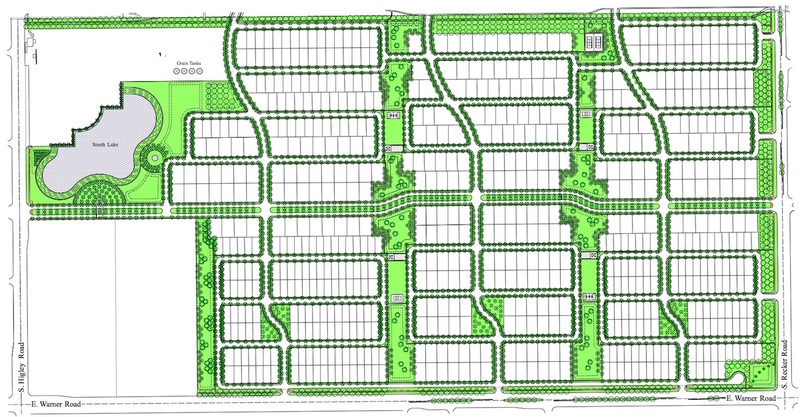 Each neighborhood is linked to the rest of the Ranch, including its professional, recreational, commercial, and educational facilities, by an extensive system of interconnected open spaces and walking trails, encouraging residents to venture outdoors and experience all that their community has to offer. Click on each neighborhood below to find out more. Located in the northwest corner of Morrison Ranch, Higley Groves has the distinction of being the first neighborhood developed within the Ranch. As such, Higley Groves is unique in that it is governed by two associations independent of the Ranch’s Community Council. These three governing bodies, however, all work closely together to ensure that the overall character of the Ranch is maintained within Higley Groves, just as it is within the other Ranch neighborhoods. For more information on each association, visit the Homeowners Page. Lots in Higley Groves range from 6,000 to 20,000 square feet, with homes by Shea, Morrison Homes, Trend Homes, Richmond America, and Greystone. Seven interior parks, including four tot lots, provide residents with outdoor recreational opportunities. FUN FACT: The Morrison Ranch planning offices — in what was once Grandma Morrison’s house — is located within Higley Groves at Morrison Square. 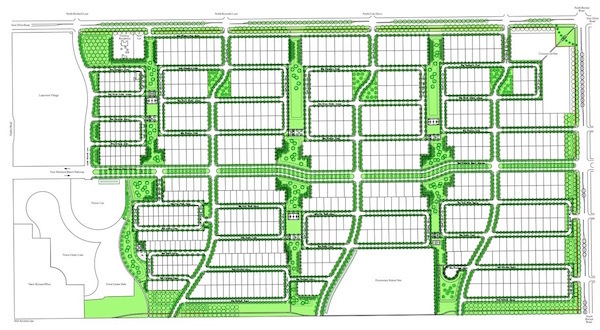 Higley Estates features the largest residential lots within Morrison Ranch, ranging from 10,000 sq. ft. to 1 acre. Adjacent to Lakeview Village and the recreational lake at Morrison Town Center, Higley Estates covers more than 100 acres and offers residents four interior parks, including one tot lot. FUN FACT: Lela Morrison - affectionately known as "Bunky" to all who knew her - was one of Higley Estates' first residents. She lived in a home on the east end of the neighborhood, with the perfect view of her late husband Kenneth's old farm office and the Ranch's iconic grain silos. She lived there happily until her passing in 2013. Warner Groves is the western end of Bloomfield Parkway, the southern most parkway of Morrison Ranch's three unique east/west parkways. 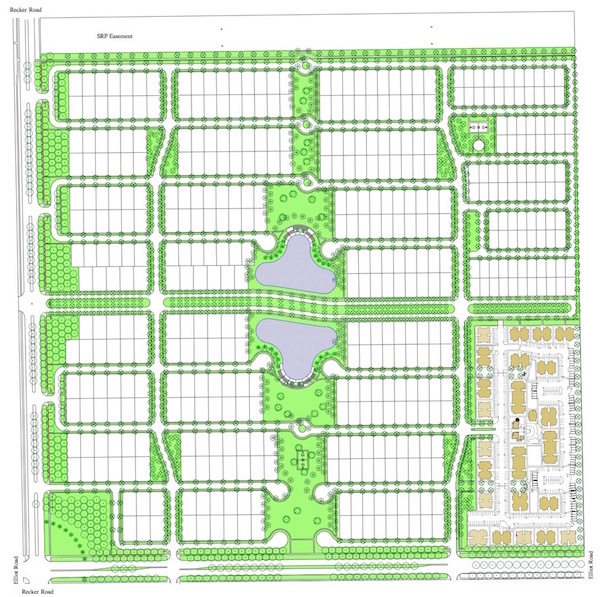 At the heart of the neighborhood, tot lots and recreation facilities occur on both sides of the parkway giving all the residents convenient access to the open space and recreation facilities. 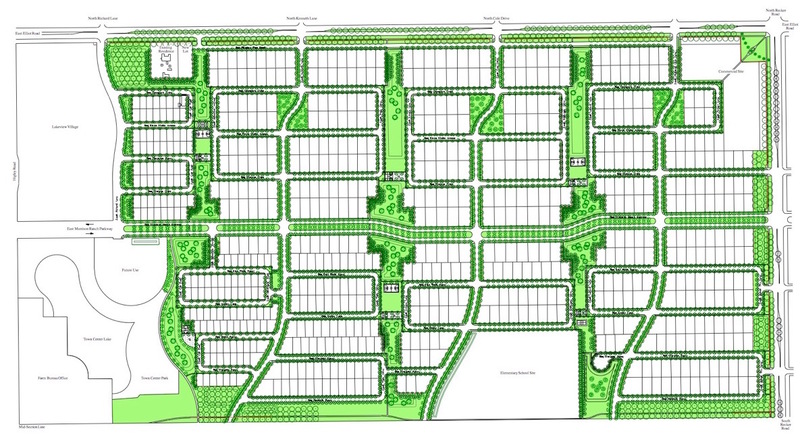 Residents will have indirect access to a small neighborhood shopping center at the corner of Higley and Warner roads, as well as direct access to Morrison Ranch Town Center, located just across the street. 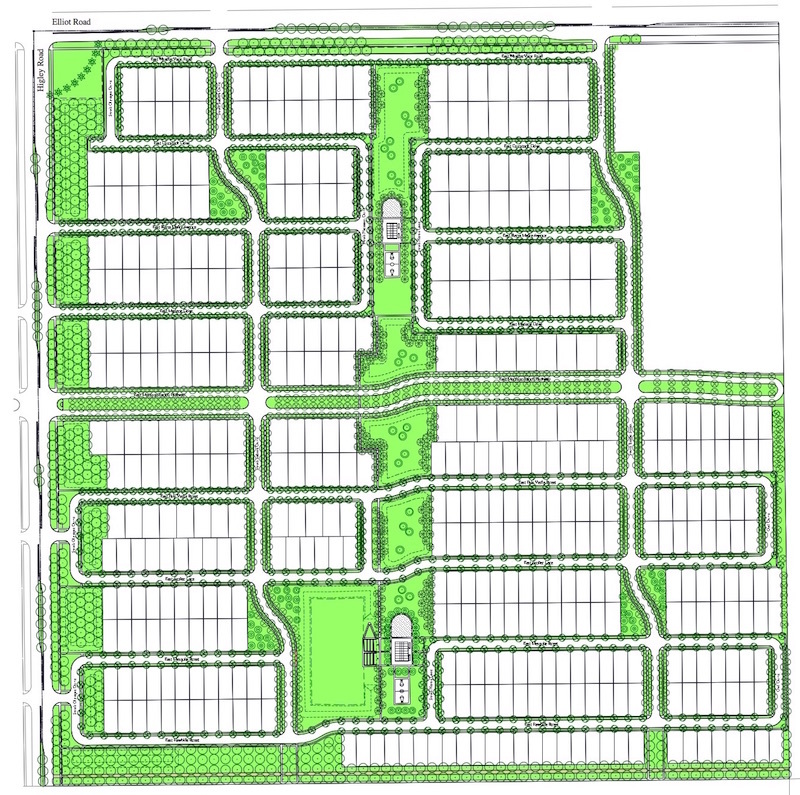 Lakeview Trails is the Ranch's largest residential neighborhood, split into three sections: north, southwest, and southeast. All three phases of Lakeview Trails will eventually be part of one integrated whole. Lakeview Trails North is complete. To the west of the neighborhood lies Morrison Ranch Town Center. No other Ranch residents have such direct access to Town Center as those living in Lakeview Trails, thanks to the extensive greenbelt and trail system that runs throughout the neighborhood. At the heart of Lakeview Trails North lies the only Morrison Ranch elementary school site, although the Holliday Farms school site, to the north, will probably be "claimed" by Higley Groves. FUN FACT: At the northwest end of Lakeview Trails, along Elliot Road, the former home of Hugh and Lena Nichols is being maintained. "Uncle Hugh" was known to early Gilbert residents as the farmer who kept reindeer and exotic birds, and the preservation of his home is a salute to the heritage of the Morrison family. Lakeview Trails is the Ranch's largest residential neighborhood, split into three sections: north, southwest, and southeast. All three phases of Lakeview Trails will eventually be part of one integrated whole. Lakeview Trails Southwest is under construction, with homes anticipated to be available in mid 2018. 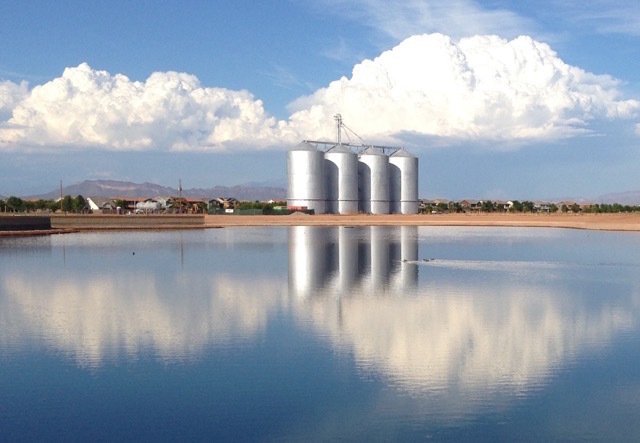 Lakeview Trails Southwest includes the second of the Ranch's two featured lakes at the base of the iconic grain silos. 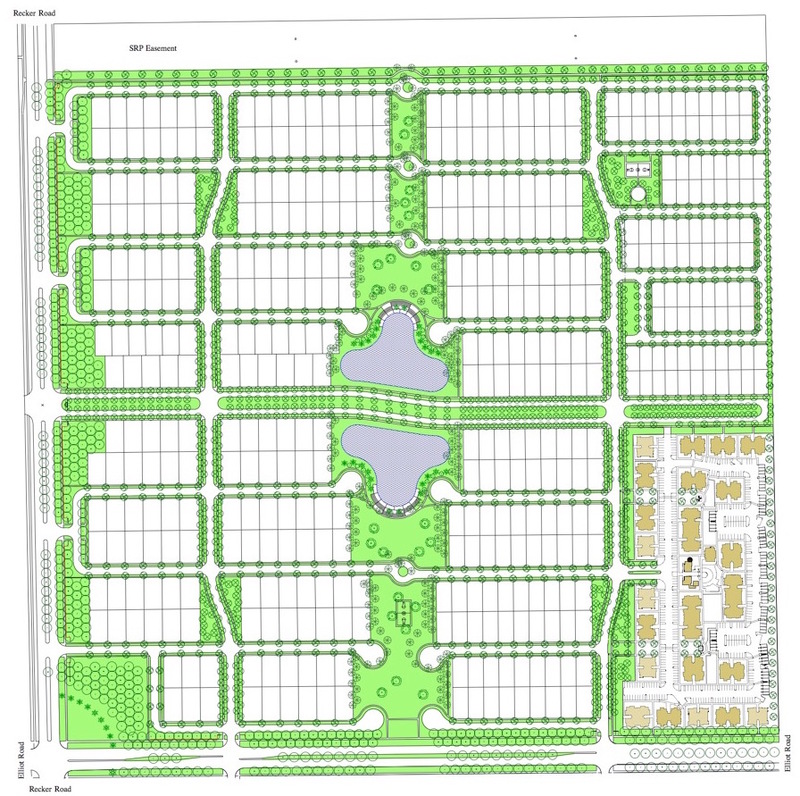 Residents can easily bike or walk to enjoy the open park spaces surrounding the lake. The iconic grain tanks will remain in place as a reminder of the agricultural heritage of Morrison Ranch. Just west of Lakeview Trails Southwest, there is room for apartments as well as a shopping center which will complete Town Center. However, these will not be developed just yet. Land development on Lakeview Trails Southwest has begun, and homes could be available midF 2018. Lakeview Trails is the Ranch's largest residential neighborhood, split into three sections: north, southwest, and southeast. All three phases of Lakeview Trails will eventually be part of one integrated whole. 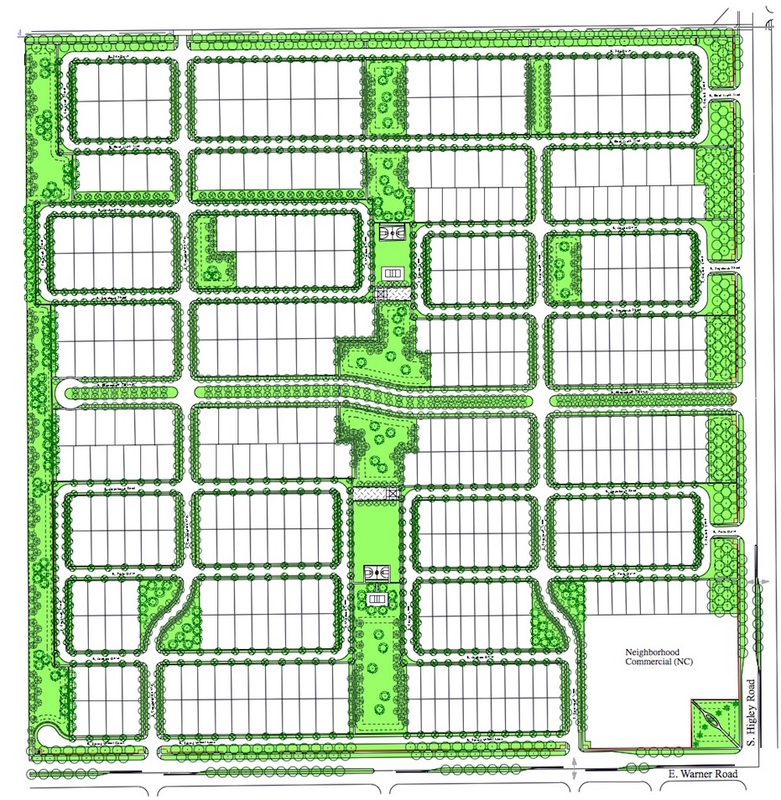 Lakeview Trails Southeast will be the last phase, and its development date is yet to be determined. Lakeview Trails Southeast will have the same variety of lots as Lakeview Trails Southwest, with sizes for every family. Lakeview Trails Southeast will complete Bloomfield Parkway's connection from Higley to Recker, similar to Morrison Ranch Parkway. The timeline for development on this project is yet to be determined, but initial estimates put it in 2019. Two recreational lakes in the heart of Highland Groves are surrounded by community recreational facilities, including BBQs, play areas, picnic areas, and shade structures. Homebuilders US Home, Morrison Homes, and Ashton Woods have completed the development of Highland Groves with a variety of detached homes (5,000 to 7,000 sq. ft. lots). With a broad range of lot sizes, and apartments, Highland Groves provides quality housing that fit a wide range of budgets. Residents of Elliot Groves enjoy an ideal location between Lakeview Trails and Morrison Ranch Business Center. Here, you can walk or bicycle to work or play. Elliot Groves is comprised of single family homes as well as apartment homes, accommodating families of all sizes. Elliot Groves will also boast a large internal park system, two tot lot play areas and a large playing field with a barn like shade structure large enough for group gatherings or sports events. Desert Place is the only Morrison Ranch residential neighborhood located within the City of Mesa. Therefore, no reclaimed water will be available for landscape irrigation. 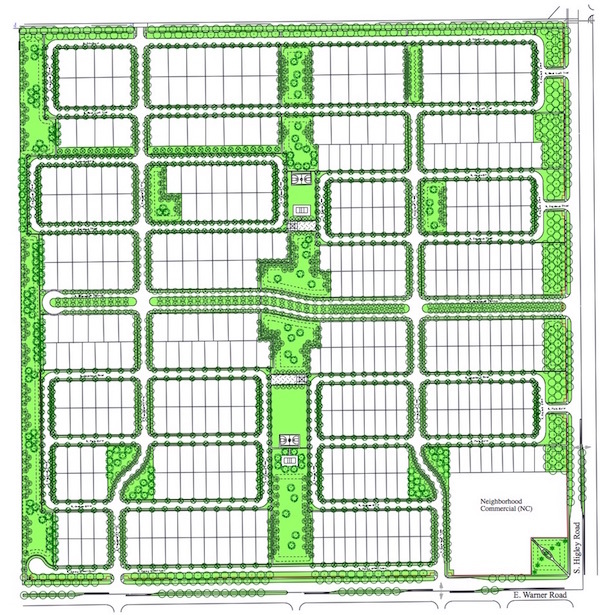 The entire community does, however, offer all the same landscape, recreation and urban design concepts typical of Morrison Ranch projects. From Guadalupe Road and Sossaman Road, Desert Place has wide landscaped setbacks with groves of Sisso trees and green leafed shrubs. Within Desert Place there is a large north/south open space and recreation system featuring tot lots, shade structures, play courts and recreation facilities for all ages of residents. The central recreation facility has a generous area for small or large gatherings and community events. All homes are connected to the recreation areas by sidewalks and trails. 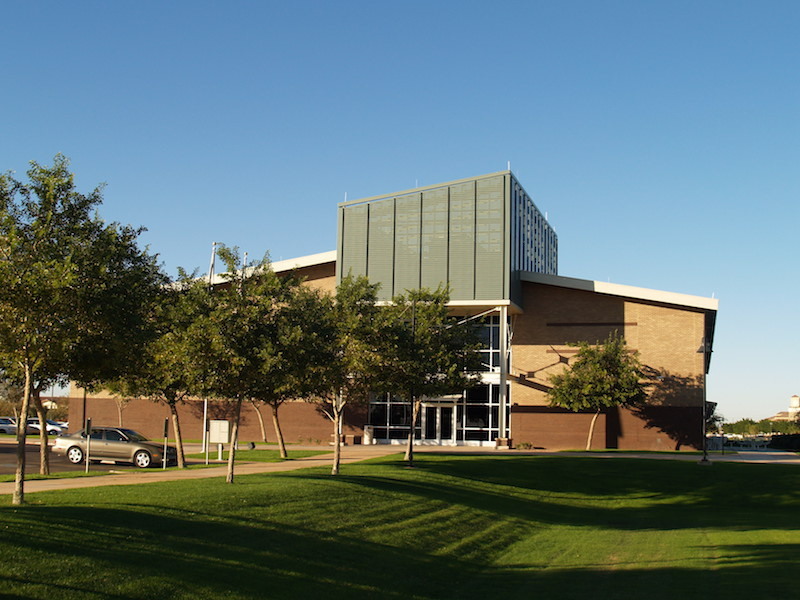 Highland Junior High is located to the west of Desert Place and has its own separate pedestrian trail connecting the two projects. The first phase of Town Center includes the Lakeview Village shopping center. Some of Lakeview Village businesses: Nails & Spa Talk, Great Clips, UPS Store, OmniNuvo Realty, Edward Jones, H&R Block, Higley Groves Dental, Carousel Cleaners, Dance Republic, Subway, Pool Werx, H1 Martial Arts, Basha's, Panda Express, Bank of America, Four Silos Brewery, and Core Body Pilates. It also includes the state headquarters for Farm Bureau, including their insurance operations. And, while not yet under construction, Morrison Ranch is under contract for a 4.5 acre assisted living facility east of the North Lake. Many expansion opportunities exist in the southern half of Town Center, both at the NE and NW corners of Higley and Warner and south of Farm Bureau. On the east side of Morrison Ranch lies the Morrison Ranch Business Center, a 275 acre campus-like business and technology complex. It is ideally located between the US 60 Superstition Freeway and the Loop 202 San Tan Freeway. The Business Center has multiple points of access to the Phoenix Metro freeway system. It is also within 2 miles of Phoenix Mesa Gateway Airport, with all the cargo and passengers services offered there only minutes away. With approved Business Park (BP), Light Industrial (LI), and General Commercial (GC) zoning, the Business Center accommodates a broad spectrum of industrial and office uses.